As Cozumel has become a popular tourist destination, more and more of the island has been given over to beach resorts and other attractions. Still, part of the island has been preserved in its natural state. The Punta Sur Eco Reserve at the southern tip of the island is one such place. 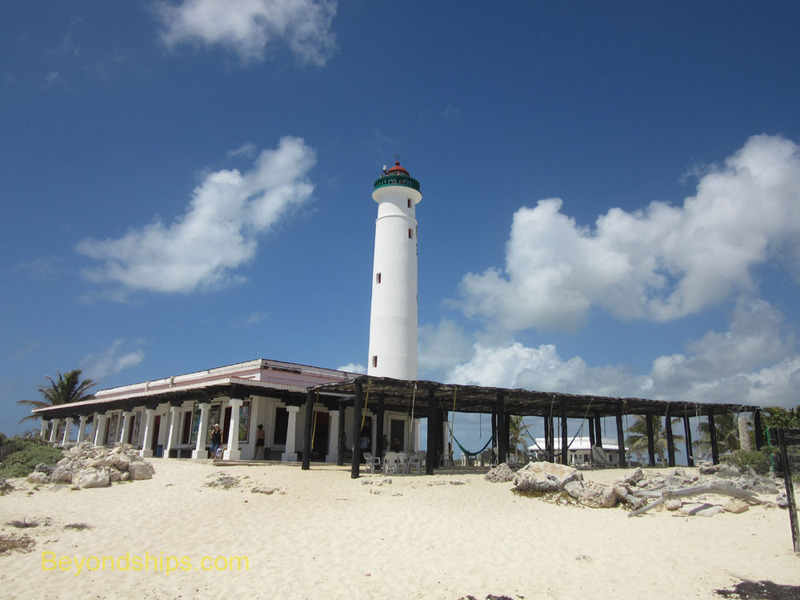 To see some of this undeveloped area, we took a shore excursion called “Photo Safari and Beach Expedition” to Punta Sur. Transportation for this tour was by safari truck. Essentially, this was a truck that had been painted in a tiger-stripe pattern. It had seats and a canopy on the back. The sides were partially open and so a strong breeze blew through the passenger area when the truck was on the highway going to and coming back from Punta Sur. 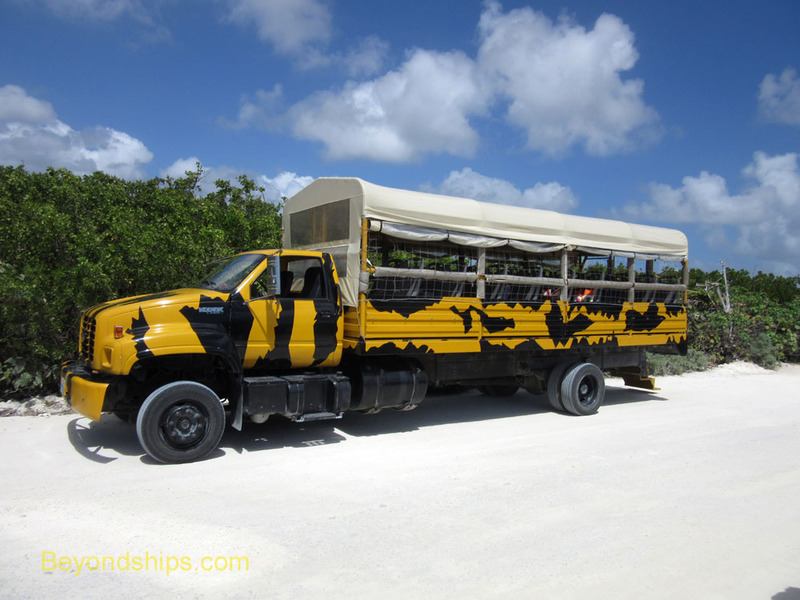 The need for such a vehicle became apparent when we reached Punta Sur. Here, the roads were unpaved and a strong suspension was clearly necessary. The few other vehicles that we encountered in the park were similar trucks, jeeps and other all terrain vechiles. Our first stop was the crocodile sanctuary. A sign by the entrance said that the Cozumel Parks and Museum Foundation promotes conservation, research and education about crocodiles. It also advised visitors not to go swimming in the lagoon where the crocodiles live. Located just off the road, you access the viewing platform via a rough wooden walkway that eventually circles round to become a viewing platform. Some of the boards making up the walkway have deteriorated with time and/or are just loosely attached to the structure. Since the walkway is suspended above a shallow portion of the lagoon, this caused some visitors to comment about the possibility of crashing through the floor into the water. While the water below you is at most about a foot deep, crocodiles do live in this water. However, the guide assured us that the structure was perfectly safe and indeed no one ended up having a Captain Hook experience. Only two crocodiles were at home when we called. One lay perfectly motionless next to the viewing platform. Another much larger crocodile swam in the lagoon about 20 yards away. Neither seemed particularly interested in their visitors. The guide explained that you can tell the difference between a crocodile and an alligator by the nose. Alligators have a more squared off snout. The animals we saw had relatively pointed noses. The guide went on to say that crocodiles were capable of bursts of speed up to 60 miles an hour. So although the one by the viewing platform may appear quite idle, she can be quite quick when she sets her mind to it. Further off in the lagoon were two large birds. One was a pink flamingo, which bobbed its head into the water every so often apparently after something to eat. Off in another direction was a large white crane who like the flamingo seemed to be traveling solo. Neither bird seemed concerned about crocodiles. Next to the viewing platform was a wooden observation tower. A sign said that its maximum capacity was 10 people but the guide limited us to six people at a time. From the tower, you had a more panoramtic view of the area. The lagoon itself was not the picture of a tropical paradise. The shallow water spread out over the countryside interrupted by low islands partically covered by scrub vegetation. It was an isolated and desolate landscape. Still, in all, it had a peaceful feel. Near the entrance to the crocodile sanctuary was a Mayan structure called “El Caracol.” According to the sign, this low lying structure could have been used as a shrine, a lighthouse or as an alarm station. 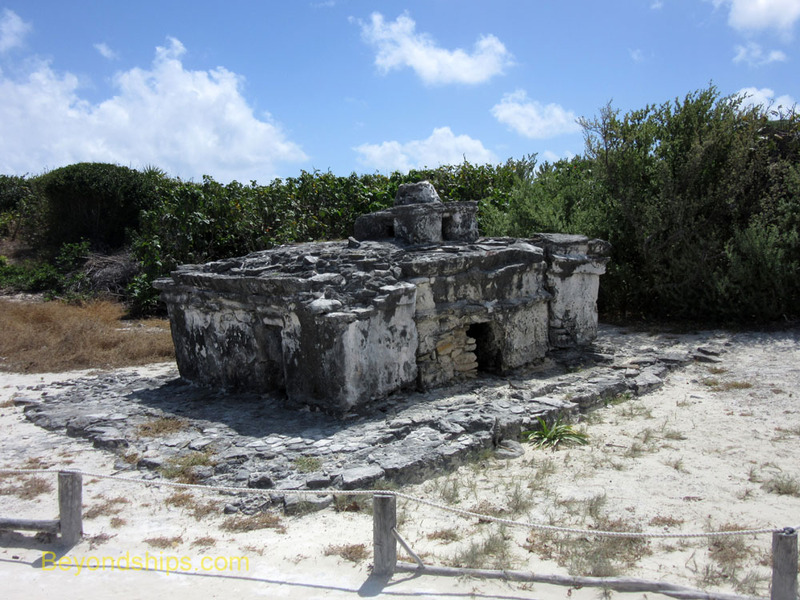 The cupola atop the structure houses a number of conch shells and when the wind is powerful enough and coming from the right directon, the shells let off a sound. Procceding along the unpaved coast road, the safari truck stopped next at the Punta Celarian Lighthouse. A classic white clinder, the lighthouse stands on a relative high point in this generally flat area. At its base is a building that houses a bar and restaurant as well as a small museum. Some nearby buildings house some shops selling local crafts and souvenirs. Visitors can climb the 130 or so steps to the op of the tower to view the surrounding sea and land. However, most visitors choose to stay at ground level and explore the area. The most outstanding feature was the surf crashing against the rocks in front of the lighthouse. 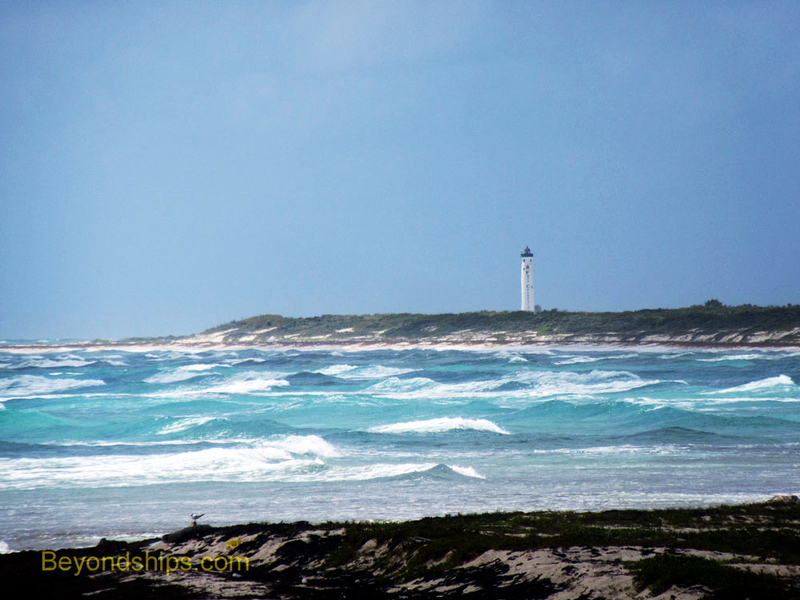 A wide sandy beach separates the lighthouse from the sea. However, even without the signs that explicitly say so, it is easy to see this is not a beach for swimming. Tall white crested waves can be seen rolling in from some distance with considerable speed and then crashing against the rocks that lie at the water's edge immediately in front of the lighthouse. These waves explode with white water shooting up in 20 foot sprays. Further to the east, the scene is not quite so dramatic. You still have the powerful white capped waves but they do not explode when they reach the sandy beach. Interestingly, the sea is an array of colors. Near the shore, the water is turqoise, further out to the east it is a dark green while directly out to sea, the water is a deep Prussian blue. All of these areas are marked with the white lines of the wave creasts. Below: Scenes from the crocodile sanctuary. Above: The Mayan ruin El Caracol. Above: The Punta Celarian Lighthouse. Below: The beach at Papita's. Around the lighthouse are several uninhabited structures. One is the ruins of a small, stone Spanish colonial building. Off in another direction is a reproduction of a wooden Mayan hut. After driving further along the unpaved road through the undeveloped landscape, we came to a beach club called Papita's. Here, we spent a little over an hour relaxing by the sea. 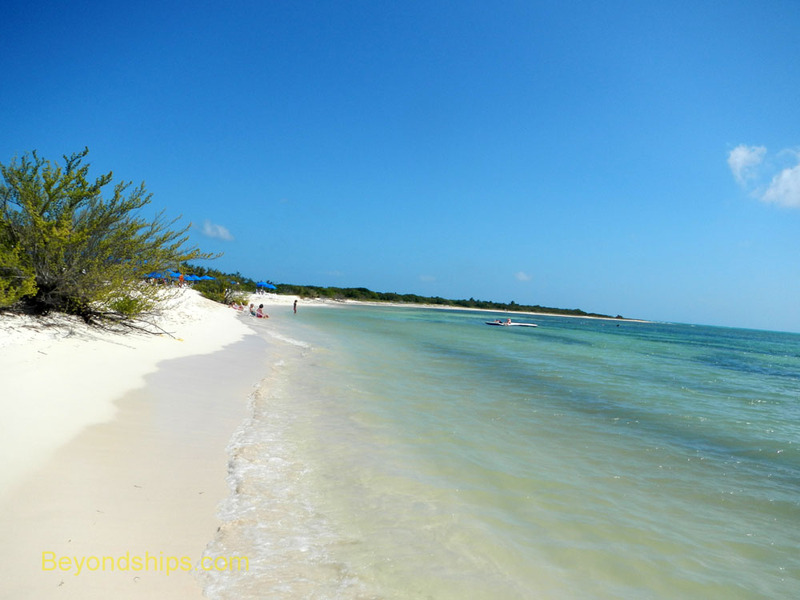 The beach here consisted of a wide expanse of white sand leading gently down to calm turquoise water. There was some seaweed further out but for the most part, the bottom was sand. The water itself was clear and warm. On the sand in front of the beach were rows of white plastic sun loungers and blue umbrellas. Use of these was included in the price of the tour. Visitors could also sit in the bar which was housed in a wood structure that was open on the side facing the beach. The club also offered massages in another building. Alcohol, food and massages cost extra. Surrounding the club on either side was undeveloped beach. Here, some hardy vegetation grew out of the sand and the remains of seaweed that had washed ashore marked the waterline. A couple walked along this section of the beach hand in hand. Even if you choose not to explore this area, the surrounding natural beach was a plus because it served to isolate the more developed beach from the outside world. A reef lay offshore and our guide escourted those visitors who wanted to go snokeling out to the reef. There was almost no discussion of photography on this tour. Only one participant had a high end camera, the rest used point and shoot models. However, we did go to several interesting and picturesue places. We saw wild animals, Mayan ruins, dramtaic seascapes, land in its natural state and a pretty beach. Thus, there was plenty of opportunity to take interesting photos.